Join us for an evening to benefit The Doula Program to Accompany and Comfort. The demand has never been greater for Doula Volunteers in hospitals, health- care facilities and in peoples' homes. 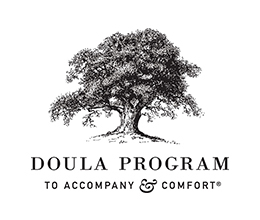 The Doula Program collaborates with a wide range of organizations including hospitals, homecare, hospice organizations, nursing homes, social service agencies and religious institutions. Requests for a Doula Volunteer are made for individuals who appear isolated in their illness and would benefit from a Doula Volunteer relationship. Contact Amy Levine, Executive Director, alevine@doulaprogram.org or call 212-706-0398. Doula Volunteers commit to visiting one time weekly for a minimum of an hour and schedule their own visits. What do Doulas do? Doula Volunteers are specially trained to visit as illness progresses. Our Doula Volunteers provide an ongoing relationship as illness progresses. Activities vary depending upon each individual / and safety and can include: talking, reading, listening to music, watching TV or a movie, special projects, walking outside, or sitting quietly. Doula Volunteers visit weekly with one individual until he or she dies. These meaningful relationships last weeks, months and years. The Doula Volunteer will continue to visit if the location changes, services change or the person is admitted into the hospital. Once a Doula Volunteer is assigned, she/he is supervised weekly by a Doula Program professional staff. Doula Volunteers attend regular meetings and educational groups, facilitated by Doula Program staff. The Doula Program hosts Doula Volunteer events, to honor the lives of clients who have died and to allow Doula Volunteers to come together as a community. Mount Sinai Medical Center's Palliative Care Service, Bellevue Hospital Palliative Care Service , NYU Medical Center , Columbia Presbyterian Hospital Palliative Care service, Lenox Hill House Calls Program, Mount Sinai Senior Health, Greenwich House, The New Jewish Home, SAGE, Self Help, MJHS Hospice, Calvary Hospice, Dewitt Nursing Home, Marble Collegiate Church, and Dorot. 212 706 0398 | alevine@doulaprogram.org | ©2000-2019 The Doula Program to Accompany and Comfort, Inc.